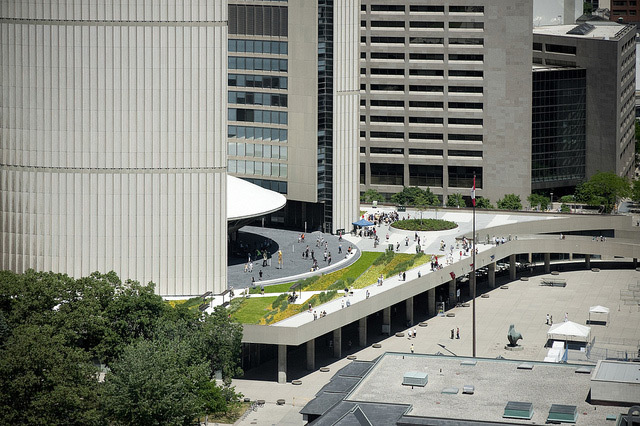 City Hall during this year’s Doors Open. Photo by Bryson Gilbert from the Torontoist Flickr Pool. If talk about Toronto has taken a negative turn, a new collection of essays called Local Motion is trying to get us out of the doldrums. Edited by Dave Meslin, Christina Palassio, and Alana Wilcox, Local Motion features fourteen essays on how to participate in the city, and is the sixth and final book in the uTOpia series published by Coach House Books. The series began in 2005 with uTOpia: Towards a New Toronto and continued with books on the arts, the environment, water, and food. As Meslin explains, “The real goal of this last book is to unleash the energy that was on the pages of all the previous books” by shifting from the what of Toronto to the how. The most effective tool in the book’s kit is information—what goes on behind the bureaucratic veil: Ed Keenan explains electoral reform and how our system favours incumbents, our own Hamutal Dotan explains the development process and how residents are (or aren’t) involved in it, Kelly Grant explains Toronto’s closed budgeting process and participatory alternatives, Dave Meslin explains how to be heard at City Hall, Christina Palassio explains how to run for city councillor, and Jennifer Lewington explains how to harness the power of the media. For a book series named “uTOpia,” Local Motion‘s goals are modest: it doesn’t aim at especially lofty dreams for a better tomorrow. A few essays do focus on bigger ideas, but ground them in real life: Bert Archer writes about framing activism as an exercise in saying “yes” rather than “no,” Jason McBride and Jonathan Goldsbie write about versions of do-it-yourself activism and avoiding red tape, and Mike Smith writes about what it means to be a creative city. Local Motion is making a claim to the city at an interesting moment—published after election day but written before we knew that Rob Ford would head the city for the next four years. Several authors raise the spectre of a hostile City Hall, but the book doesn’t give in to whining or ranting; these essays remain remarkably positive and don’t preach (even to the choir). Meslin, too, rejects the idea of a divided city, and thinks Local Motion speaks to more than the self-identified progressive crowd. As an example, he cites praise from both Naomi Klein and John Tory (printed at the beginning of the book) to reflect its multi-partisan approach. The fact that Local Motion is devoted to “better,” but doesn’t take sides in defining the word, is its greatest strength—it separates politics from the people, and shows us what we have in common in our city. Coach House is launching the book starting at 8 p.m. on November 16, at an “Election Hangover Party” at Lula Lounge. The evening will include a roundtable discussion on the recent elections with Desmond Cole, Kelly Grant, Che Kothari, Jennifer Lewington, and Mike Smith. Cover is $5, or free with book purchase.